Our gold standard. 1st time amazing stain removal, even in a cold wash. Concentrated formula blue oxi-pearls with plant derived ingredients. Free from chlorine bleach. Powerful oxi action formula. Safe on everyday fabrics*, colours and whites *everyday fabrics like cotton and polyester Unbeatable Stain Fighters Hydrogen Peroxide - Releases active oxygen to lift out stains safety. Anionic Surfactants & Non-Ionic Surfactants - Remove greasy stains safely. Freshness Booster Perfume - Provides a boost of scent. Cleaning Boosters & Helpers Stabilizers including Phosphonates - Maintains product efficacy during shelf life. Pre-treat Pour 2ml of Vanish gel directly onto the stain and rub gently Leave the product in contact with the stain for 10 mins maximum After pre-treatment, wash as usual or rinse thoroughly Soak Pour 100 ml onto the stain, rub gently and then soak in 4L of water 1 hour maximum for colours 6 hours maximum for whites After soaking wash as usual or rinse thoroughly For best results on stains rub before rinsing. Wash Add with your detergent: For tough & dried-in stains x100ml For normal stains X50ml Dose detergent as normal Just add one dose in every wash Usage Advice: Always follow washing instructions on garment or fabric label. Before use, check for colour fastness by testing a hidden area of the fabric. Rinse and allow to dry. After washing or treating garments with Vanish, dry away from sources of direct heat and direct sunlight. 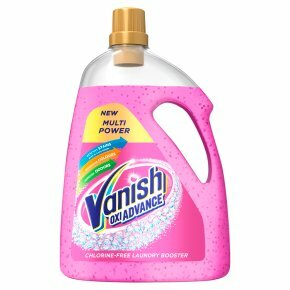 When using Vanish to pre-treat, use lukewarm water. For best results, it may be necessary to repeat parts of the process. Do not use on garments requiring dry cleaning. Do not use on any garment or rug made of leather. Do not pour the product or any metallic parts of the garments (e.g. buttons, zips). Do not expose pre-treated or soaked garments to sources of direct heat or direct sunlight before washing or rinsing thoroughly. Do not leave the product to dry on garments (maximum 10 minutes contact time). Do not expose product to direct sunlight. VANISH GOLD OXI ACTION GEL. Contains: Hydrogen Peroxide, Sodium C10-13 Alkyl Benzenesulfonate, Alcohols, C12-14, ethoxylated. Causes serious eye damage. Causes skin irritation. May be corrosive to metals. Keep out of reach of children. Do not get in eyes, on skin, or on clothing. Wear eye protection. Wash hands thoroughly after handling. IF IN EYES: Rinse cautiously with water for several minutes. Remove contact lenses, if present and easy to do. Continue rinsing. Immediately call a doctor. IF SWALLOWED: Call a doctor if you feel unwell. Keep only in the original packaging. If in contact with skin whitening may occur, do not be alarmed. The whitening effect is temporary and reversible. In case of splashing, rinse immediately with plenty of water. For sensitive skin, the use of gloves is recommended. Keep away from direct sunlight. Do not mix with other products.